Barely two days after Prime Minister Narendra Modi’s Pariksha Pe Charcha where he tried to reach out to students, youth and parents over exam stress and related issues , the interim budget presented by his government on February 1 didn’t show a similar inclination as education has been almost omitted from budget vocabulary. Writing in the Indian Express, Ashok Thakur, former HRD secretary opines thatoOne could not but conclude by the end of the Budget-2019 speech that education was no longer the important building block in nation building that it was once considered. Education experts have called it big disappointment for education sector . A mere allocation of Rs 38,572 crore (only negligible increase of Rs 6,238 crore from previous year) under National Education Mission of which only Rs 36, 472.40 crore for school education under the Samagra Shiksha Abhyan is grossly inadequate to universalise education up to secondary level in the country. Piyush Goyal announced developing the national Artificial Intelligence (AI) portal as a part of the National Programme on Artificial Intelligence. The government will also establish the National Centre on Artificial Intelligence and Centres of Excellence for AI programme. “National programme on artificial intelligence (AI) has been envisaged by the government. 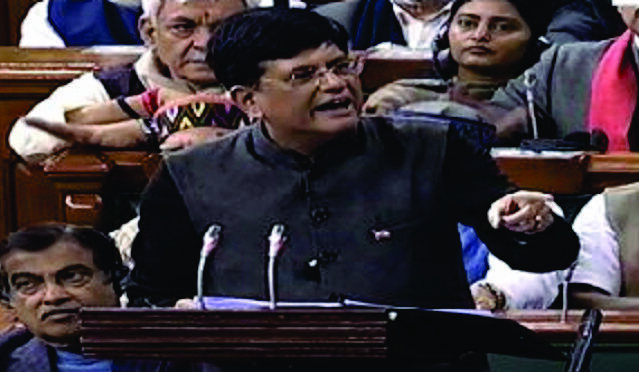 National centre on Artificial Intelligence as a hub along with Centres of Excellence has been established,” said Goyal in the parliament. Experts have been saying that for the country to touch 8% growth rate, it will have to increase the spending on education. India is positioned much lower than its neighbors in the human advancement list (HDI) which is a marker or indicator of the social sector, particularly education, employment and so on. New businesses or information overloads can’t be a guaranteed mode of prosperity or youth empowerment. Information cannot be converted into knowledge without education. Education is needed to develop right kind of attitude, outlook, perspectives and how to learn for life. Puja Marwaha, CEO at CRY – Child Rights and You : “The Interim Budget 2019 has shown positive trends towards the vulnerable sections of our society, including farmers, small entrepreneurs and the tax-paying middle classes. Yet, for almost 40% of India’s population comprising of its children, it failed to address the expectations of the nation, as children were neither a part of the Budget Speech, nor were they visible anywhere in the 10 point vision for 2030. “The first level analysis of the budget documents reveals that the overall budget outlay for children is just 3.25% of the total Union Budget, with a negligible 0.01% increase since last financial year. In gross terms it records an increase of Rs. 9,358 crores from Rs. 81,235.63 crores in 2018-19 (RE) to Rs. 90594.25 crores 2019-20 (BE) [Analysis based on Statement -12 uploaded by MoF]. “However, it is welcoming that some areas such as the National Nutrition Mission (NNM) has got an increased boost of 410 crores [from Rs. 2,990 crores in 2018-18 (RE) to Rs. 3,400 crores in 2019-20 (BE)], and Integrated Child Development Scheme (ICDS) witnessed an increase of Rs 4,227 crores, [from Rs. 23,357 crores in 2018-19 (RE) to Rs 27,584 crores in 2019-20 (BE)]. We hope that the huge vacancy gap in Angawadis as well as universalised coverage of ICDS services for children under six years sees a visible improvement with this additional budgetary allocation. “There is also some increase in the area of protection of children in Integrated Child Protection Scheme (ICPS), which has received a boost of Rs. 575 crores over last year. However, the area of protection, especially prevention of crimes against children, is huge and it requires much more resource allocation. We can only hope that this is adequate enough to address the burning need of curbing violence against children. Rohit Manglik, CEO, EduGorilla: “This year’s Budget lays down progressive measures which, if implemented well, will certainly take economy onto a higher trajectory. The Budget is notable for its roadmap for 2030 focussing on ten dimensions which are key growth drivers of the Indian economy. This year’s Budget gives a reason for SMEs to cheer considering various incentives announced by government to propel their growth. Various tax benefits and thrust on ‘Make in India’ is a testimony to the government’s intent of encouraging entrepreneurship; enabling India to emerge as the startup hub where “Job Seeker is now the Job Creator”. The move to source atleast 3% material from women-owned SMEs by Government enterprises will provide an impetus to women entrepreneurship. Tarun Bhalla, CEO & Founder, Avishkaar: Budget 2019 will prove to be a godsend for the Artificial Intelligence (AI) sector in India. With over 200 AI start-ups currently innovating AI-based solutions in the country, they’ll help serve the society and help make a marked difference in the education, healthcare, transportation, infra and agricultural sectors of India. Divya Jain,CEO, and Founder, Safeducate : “With the scheme of modernizing the villages, and going digital will help in Skilling the youths in such villages, making them self-reliant and finding progressive careers for themselves while contributing to the household incomes as well. In most of the villages, women are still not allowed to go out of their homes – Digital villages will help to reach those women and skill them. Even though through various schemes such as PM Mudra Yojana, Government have been trying to educate women and work towards the cause of women empowerment, but still a lot of women have been deprived of it – Digital villages will likely ensure such benefits reach them faster now. Kapil Rampal, Director of Ivory Education: “The Union Budget of this year is an interim budget focused at the election. For the education sector, it is a major disappointment. In order to incorporate the quota, there is a burden on Indian universities to increase their seats by 25% without allocation in the budget for enhancing infrastructure, faculty, and other resources required. In fact, no additional funds are allocated this year. The marginal increase in allocation is mostly for cost initiates such as fancy research projects like IMPRESS, RUSA and Uttar Bharat Program. Vineet Chaturvedi, Co-founder, Edureka: What could accelerate India’s skill development story even further and provide fodder to corporate growth is a ‘skilling allowance’ for all tax paying individuals. Such a rebate that rewards continuous learning will go a long way in creating an industry relevant workforce that can make India a skill hot spot. Continuous learning is a necessity and not just an option anymore and by treating it on par with necessary allowances such as HRA, LTA, DA & others, GOI would be doing India a great service. After all, India’s biggest strength is its human resource. Such an allowance will also be beneficial to IT, ITes industries which are subject to frequent skill churn and the ed-tech industry which has been working towards addressing this skilling need on ground. Beas Dev Ralhan, CEO, and Founder, NextEducation India Pvt. Ltd.: “India needs to integrate itself with the global big bang of technology, and the government has taken a welcome step towards it by declaring a nationwide programme on Artificial Intelligence (AI) in the Union Budget 2019. This programme involves the establishment of a National Centre for Artificial Intelligence along with other centres of excellence, and the development of a national AI portal for the advancement of 9 high-priority areas including education. This will help us catch up with the leading nations such as the US and China, who are using AI and data sciences to personalising education. Apart from this, the Digital India scheme, with more than 3 lakh common service centres, is aimed at bringing digital infrastructure to every nook and corner of the country. The government intends to build 1 lakh digital villages with an internet connection and digital devices in the next few years. This, in collaboration with EdTech companies like us, will help realise the national vision of ‘Education for All’.The National Education Mission has been allocated just 38,572 crores. However, we were expecting a better cut towards the education sector”. What has Narendra Modi government delivered over last four years on the budgetary promises in the education sector?